It’s not every day that you get the opportunity to have your work showcased front and center on the main landing page for one of the largest companies in the world. Well, today is definitely my lucky day. I was interviewed last month about a drone-related project that I’ve been working on that focuses on insurance use cases and safety/productivity improvement by using cognitive/artifical intelligence via IBM Watson. 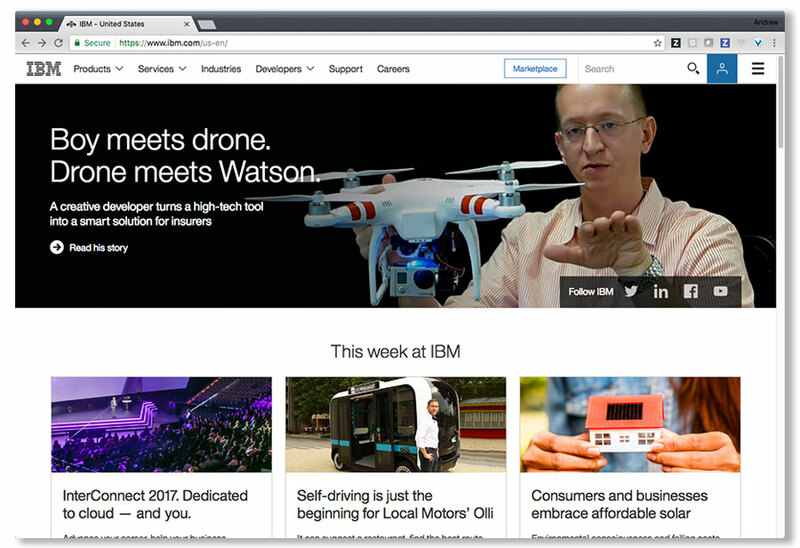 I knew it was going to be used for some marketing materials, but the last thing that I expected was to have my image right there on ibm.com. I see this as a tremendous honor, and am humbled by the opportunity and exposure. Here’s an interview that I recently did with IBM DeveloperWorks TV at the recent World of Watson conference. In it I discuss a project I’ve been working on that analyzes drone imagery to perform automatic damage detection using the Watson Visual Recognition, and generates 3D models from the drone images using photogrammetry processes. 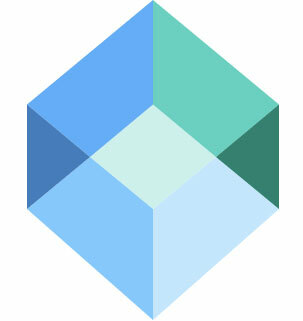 The best part – the entire thing runs in the cloud on IBM Bluemix. It leverages the IBM Watson Visual Recognition service with custom classifiers to detect the presence of hail damage on shingled roofs, Cloudant for metadata/record storage, the IBM Cloud Object Storage cross-region S3 API for massively scalable & distributed image/model/asset storage, and Bare Metal servers for high performance computing. Bare Metal servers are dedicated machines in the cloud: not shared, and not virtualized. I’ve got mine setup as a linux server with 24 cores (48 threads), 64 Gigs of RAM, a SSD RAID array, multiple GPUs, etc… and it improved my photogrammetry rendering from hours on my laptop down to merely 10 minutes (in my opinion the best part). I’ve done all of my testing with DJI Phantom and DJI Inspire aircraft, but really, it could work with any images, from any camera that has embedded GPS information. It’s been a while since I’ve posted here on the blog… In fact, I just did the math, and it’s been over 7 months. Lots of things have happened since, I’ve moved to a new team within IBM, built new developer tools, worked directly with clients on their solutions, worked on a few high profile keynotes, built apps for kinetic motion and activity tracking, built a mobile client for a chat bot, and even completed some new drone projects. It’s been exciting to say the least, but the real reason I’m writing this post is to share a few of the public projects I’ve been involved with from recent conferences. I recently returned from Gartner Symposium and IBM’s annual World of Watson conference, and it’s been one of the busiest, yet most exciting span of two weeks I’ve experienced in quite a while. At both events, we showed a project I’ve been working on with IBM’s Global Business Services team that focuses on the use of small consumer drones and drone imagery to transform Insurance use cases. In particular, by leveraging IBM Watson to automatically detect roof damage, in conjunction with photogrammetry to create 3D reconstructions and generate measurements of afflicted areas to expedite and automate claims processing. This application leverages many of the services IBM Bluemix has to offer… on-demand CloudFoundry runtimes, a Cloudant NoSQL database, scalable Cloud Object Storage (S3 compatible storage), and BareMetal servers on Softlayer. Bare Metal servers are *awesome*… I have a dedicated server in the cloud that has 24 cores (48 threads), 64 GB RAM, RAID array of SSD drives, and 2 high end multi-core GPUs. It’s taken my analysis processes from 2-3 hours on my laptop down to 10 minutes for photogrammetric reconstruction with Watson analysis. It’s been an incredibly interesting project, and you can check it out yourself in the links below. 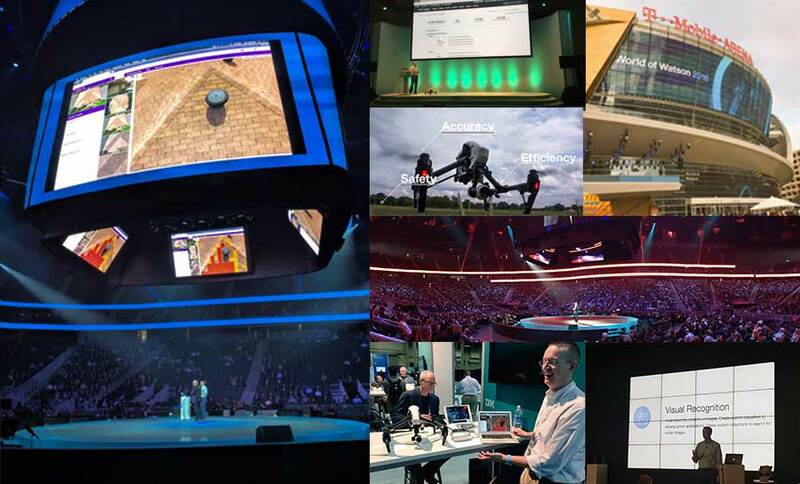 World of Watson was a whirlwind of the best kind… I had the opportunity to join IBM SVP of Cloud, Robert LeBlanc, on stage as part of the the Cloud keynote at T-Mobile Arena (a huge venue that seats over 20,000 people) to show off the drone/insurance demo, plus 2 more presentations, and an “ask me anything” session on the expo floor. The official recording is available on IBM Go, but it’s easier to just see the YouTube videos. There are two segments for my presentation: the “set up” starts at 57:16 here: https://youtu.be/VrZMQZSB_UE?t=57m16s and the “end result” starts at 1:08:00 https://youtu.be/VrZMQZSB_UE?t=1h8m0s. I wasn’t allowed to fly inside the arena, but at least I was able to bring the Inspire up on stage as a prop! .. and that’s not all. I also finally got to see a complete working version of the Olympic Cycling team’s training app on the expo floor, including cycling/biometric feedback, video, etc… I worked with an IBM JStart team and wrote the video integration layer into for the mobile app using IBM Cloud Object Storage and Aspera for efficient network transmission. On this project we’ve been working with a partner DataWing, who provides drone image/data capture as a service. However, I’ve also been flying and capturing my own data. The app can process virtually any images with appropriate metadata, but I’ve been putting both the DJI Phantom and Inspire 1 to work, and they’re working fantastically. Or check it out fullscreen in a new window.